One of the more unique ways of growing a plant, the process behind Yorkshire “forced” rhubarb is also responsible for one of the most delicious. Grown in dark sheds and harvested by hand, usually by candlelight this rhubarb is deprived of light causing it to develop a deep crimson colour and a much sweeter flavour. 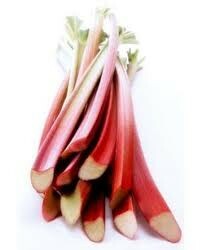 The tenderer stalks and its sweeter taste makes this variety of rhubarb a great and versatile ingredient. It can be used in sauces, sorbets, cakes crumbles or even thinly sliced, sprinkled with ginger and baked in the oven. This creates a delicious sweet and slightly spiced dessert which is excellent served with either custard or vanilla ice cream.